The last weekend in July, treasure hunters in upstate New York head to the Route 90 Garage Sale in Cayuga County. 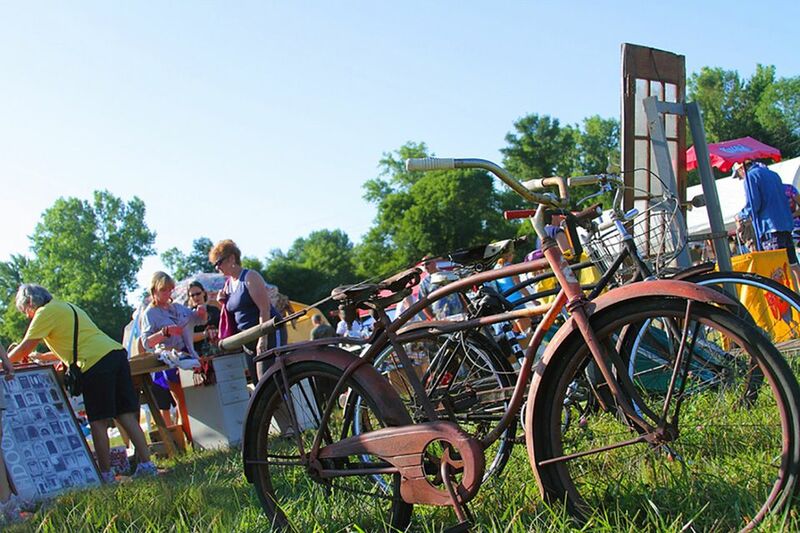 Formerly dubbed "The Finger Lakes' 50-Mile Garage Sale," this must-do summer outing runs from the town of Montezuma to the village of Homer. The legendary trek started in 1988 and features up to 500 individual sales where you can find antiques, collectibles, and typical yard sale merchandise. It draws a huge crowd each year, as local communities rally to feed, entertain, and mingle with passing tourists. New York's Scenic Byway Route 90 takes you—in true rural fashion—by hay fields on a tree-lined country road. This route, located on the eastern side of the five narrow Finger Lakes in upstate New York, twists and turns over rolling ridges, through state parks, and through wildlife habitat and preserves. This section of New York is popular for hikers, too. So pair your garage sale-going with a little recreation to create a trip that's more like a vacation. And then after your long days of fun are over, check out one of the wineries or stop by a local brewery for tasting and relaxing. Legend has it that early in the sale's history, a King Ferry man hosted a yard sale on his front lawn. Local passersby then opened up his barn and started rummaging through his belongings, at which point everything was put on sale. Following his lead, Cayuga County officially founded the massive sale as a way to promote the businesses along this stretch of the byway. The sale soon became a destination for both neighbors and bargain-finders from Canada to California. Today, out-of-state shoppers are the first ones to the deals, forcing the locals to set out their goods Friday night. And local fire stations, churches, and schools all rise to the occasion, feeding early shoppers breakfast and treats throughout the day. You can start your travels in either direction when setting out on the Route 90 Garage Sale. However, for newbies, it's best to brush up on your shopping savvy before you go. Signs galore will guide you to the best sales along the route but try not to park on private property or on the shoulder of the highway. Stick to designated parking areas, instead. A treasure hunting toolkit has everything you need to make fast, smart purchasing decisions. Make sure yours contains packing materials for breakables, so you can get your purchases home safely. And if you're looking for a new boat, car, or motorcycle (this sale is prime for big merchandise), bring your big rig and trailer. Professional flea market dealers set up along the route. Their prices will likely be higher than those of the local yard sale purveyors, but it's still worth a look for the occasional good deal. Don't be afraid to make a detour, as well, for the sake of treasure hunting. Many in-town sellers and community events are located just off the sale route (look for signs). And feel free to haggle for lower prices. But there's a right and wrong way to do it, so don't alienate the sellers by making haggling blunders. And when you need a break, stop and enjoy bake sales and local eateries in the participating cities. If you'd like to register your booth at the Route 90 Garage Sale, contact the organizers via email at info@tourcayuga.com or call them at (800) 499-9615. The office of tourism can also answer questions about anything along the route.